Castle Morgan, Cahaba, Alabama, 1863-65. Cahaba prison was located near Selma, Alabama, in the center of the now-vanished town of Cahawba which was the state capital of Alabama from 1820 to 1826. 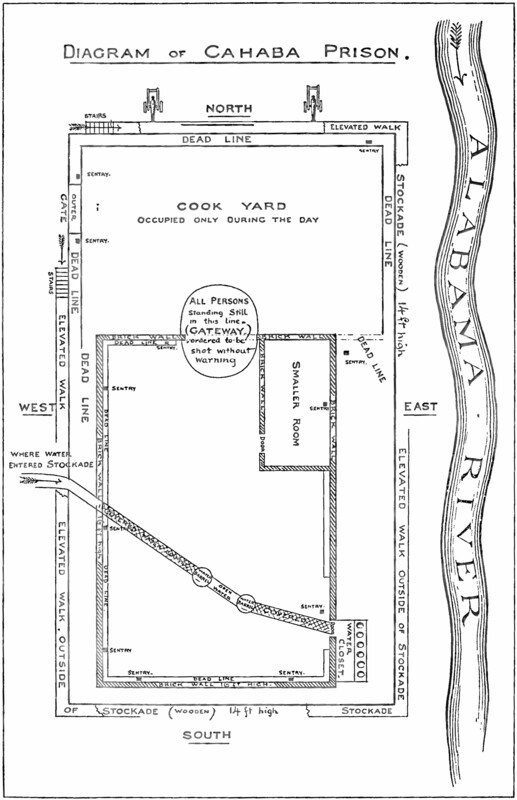 The prison was located in a cotton warehouse on the banks of the Alabama River and was in operation intermittently from 1862 to April 1865. More than 9,000 men were imprisoned at Cahaba over that time period. At its peak in 1864 and 1865, 3,000 men were housed there in with an average living space of only six square feet, by far the most crowded of any prison, north or south. Conditions were harsh, but thanks to a humane prison director and the kindnesses of town people, fewer than 250 soldiers died there. 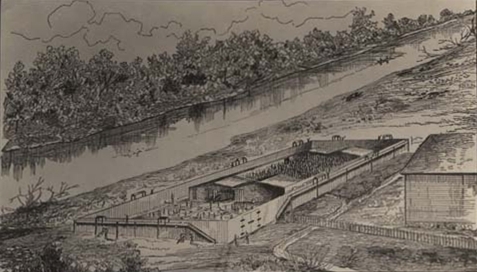 Over 800 men who had been imprisoned at Cahaba perished in the Sultana disaster on April 27, 1865. National Archives, Washington D. C. "Deaths Among Federals" at Confederate Prison Hospital, Cahaba, Alabama, Record Group 249. Also "Register of Federal Prisoners of War at Confederate Prison Hospital, Cahaba, Alabama." Record group 249. Adjutant General reports, regimental histories, and various prison memoirs.